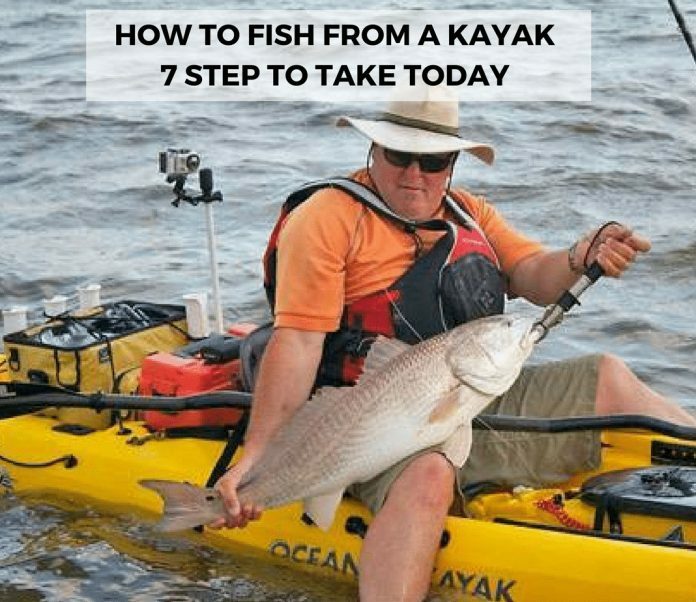 How to Fish from a Kayak: 7 Steps to Take Today - Outdoor Gear World! While the sport of fishing has many opportunities and adventures worth pursuing, there are still many who wonder how to fish from a kayak. Are you one of these people who hasn't taken the time to use a kayak for fishing yet? If so, you are missing out! There are many ways to catch mo﻿re fish with this small boat, let me show you how. There are lots of tips that will help you fish from a kayak no matter if you are a beginner or expert. Here are five of my favorite tips to get you started. If you’ve been fishing for any amount of time, you know that fish are sensitive. Any news of movement will make them run the other way. One of the reasons that fishing in the kayak is so popular is because you get to approach your fish with stealth powers. As you are approaching your fishing hole, simply glide into the position you want with some gentle paddle strokes. When you put your paddle down and begin lifting up your rod, be careful that you don’t do anything that will bang the boat. Even a small bump is going to scare those fish away and then you’ve wasted time maneuvering into that hole. Pro Tip: Want to see what you are casting at? Use polarized glasses and stand up. If the boat isn’t stable enough for you to stand, use stabilizers. If you’ve never caught a fish while sitting in a kayak, the question of what you are supposed to do has likely been in your mind. Here are some steps to help you out! Ensure the hook is set. Keep a tight line. You can do this by holding the rod above your head, just watch for trees. Double check that your paddle is secure. If you are using an anchor, attempt to steer the fish away from your anchor line. Gently reel it in close enough to land it. Pro Tip: Keep a small cooler with you to keep the fish on the ice after catching. Pro Tip: Finding the best fish finder can be tricky, check this post to find out what are the best kayak fish finders. When you are using baits that offer resistance such as spinner baits, crankbaits and chatter baits, you can let them help you steer the kayak. Once you’ve cast the crankbait from your kayak, you are going to soon realize that the resistance of reeling it in will pull your boat in that direction. That’s due to the light weight of your kayak. You can use this to your advantage by making casts in the direction you want to adjust your position into. Pro Tip: Many kayak anglers find that side-straddling the kayak is favorable. This means you sit sideways with your legs dangling in the water. It will not only offer a feeling of balance but can also be more comfortable. I know the anchor can seem cumbersome, but there is a good purpose for it while kayak fishing. Consider for example when you are on the lake and it is windy! The anchor sure will come in handy. Many kayak anglers find that a 2-4 pound claw anchor is all that they need to keep the boat still. It is also wise to use a quick release clevis when fishing in the river. Pro Tip: Don’t anchor in a current as this can push the entire boat under water. Here’s a tip for you that the professionals use all the time; use your feet during fishing. If your boat is narrow enough, you can utilize your feet as rudders. They will steer your drift on the river and can even work as anchors in shallow areas. Just stick your foot out and hold onto a log until you’ve completed fishing that area. Another idea would be to use your feet as a way to re-direct the boat away from obstacles such as logs and stumps. This is especially helpful if your hands are busy fighting that big fish on the line. Pro Tip: Practice capsizing your boat on a regular basis to ensure that you will know how to get safely back into the boat. If you are unsure, there are plenty of classes you could enroll in for paddling techniques and safety. If conditions are windy or less than desirable, use the minimal draft offered from your kayak to your advantage. Avoid paddling down the middle of a lake or river and opt to get as shallow as possible instead. You’ll experience less current this way and your paddling will be more efficient. This means more energy for you to fish. Pro Tip: Go with some experienced anglers the first few times to get a feel for proper techniques and safety procedures. Have you learned a lot from this tutorial? 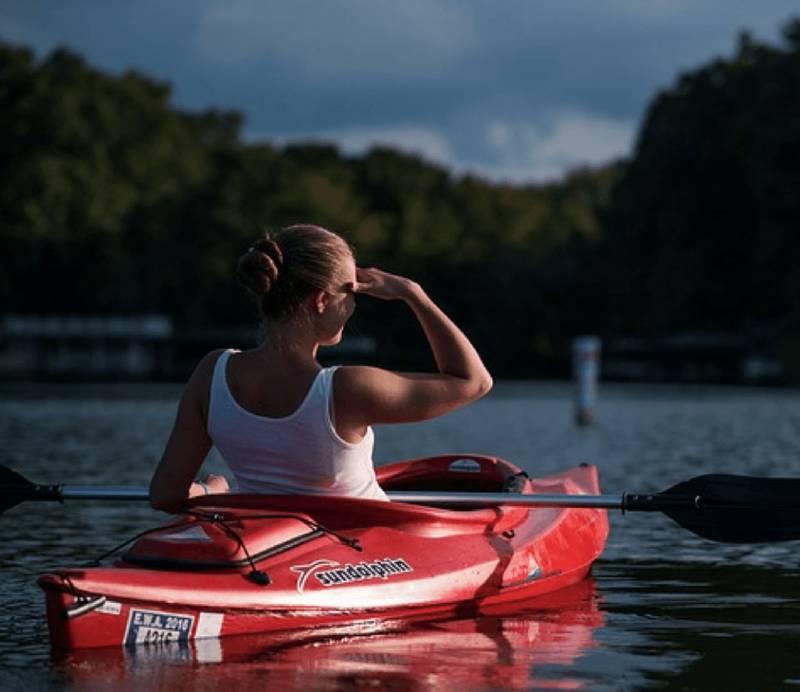 Learning to fish from a kayak might seem confusing at first and it sure does offer a challenge, but it is well worth all the effort. It may just become your new favorite way to catch dinner. I would love to hear your thoughts and experiences! Be sure to share them with me and share the article with others who can benefit from these valuable tips.